I work as an activities coordinator at a rest home in Whangarei, New Zealand. When I first announced to the residents that we would be celebrating Australia Day, they were not very enthusiastic. However, I went ahead using the ideas on this website and started the day by asking the residents, "who has been to Australia?". All the reminiscing of trips and holidays brought some positive energy. Then we had the Australian inventions, jokes and slang meanings which brought a lot of laughs. During morning tea I played a Slim Dusty CD with all the well known Aussie songs on it. Afterwards we played the beach volley ball game, followed by throwing Jandals (thongs). The residents really got into the action. I finished off the morning's activities with the Aussie quiz. After lunch we watched a DVD about the Great Barrier Reef and I handed out copies of the Word Search puzzle for the residents to do later on in their own time. 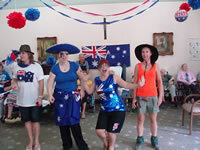 Everyone really enjoyed the Australia Day celebration. Thanks for all the great ideas. Hi Sharon, what a great Australia Day! Well done! Than you very much for sharing it. We can do the same when Waitangi Day comes along. You showed initiative and you seem to be an enthusiastic person, your clients are lucky to have you. Best wishes. We have an Australia Day function every year. We invite all our staff, dress up, decorate the room, put on temporary tattoos, we have 'Aussie' food, thong throwing comps, trivia, jokes and a lot of fun! As we are a not for profit org. i always have a fundraising raffle as well. This year i will be trying the damper recipe i found on here! This is our Australia Day activities. The staff joined in the parade and we played thong throw, egg and spoon race, a giant map of Oz that we placed iconic pictures in the right state. 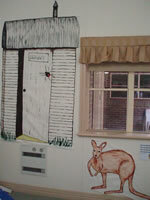 The kitchen did an Australian menu and I decorated the room with pictures I had painted. I also came as "Louie the fly", which we sang along to, as well as other songs. 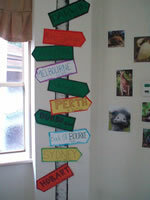 I decorated our room with Aussie picture I painted, eg: Dunny with a red back and a sign post with different towns and distance to them. The table decorations were Balloon holder with a flag and two gripping koalas. We had the staff dress up for a parade and played thong throw, egg and spoon race, sing-a-long and also had a giant map of Australia and had to place pictures of iconic landmarks on it. Thanks for sharing these photos Heather, looks like lots of fun! I decorated our activities room using Aussie beach towels, as we live in the country I used australian horse gear such as stock saddles and bridles etc which was enjoyed by our men with great interest. 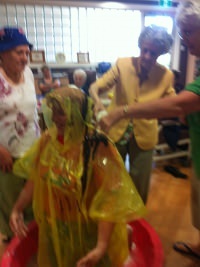 I was the giant lamington and the residents had fun at pouring the ingrediants on me especially when it got to the eggs and chocolate sauce. I hold a theme luncheon each month and so far our residents have enjoyed, Italian Culture, Festival of the garden, teddy bears picnic, wonders of the world and a beach party... They get excited to see how their activities room transforms into a magical room of colour and becomes a restaurant just for them,. I get our chef to provide all the food to go with the theme. I find as I have many who no longer have confidence to go out in the community this is a great way they can still be a part of the social aspect of getting dressed up to go out, usually they are the first to arrive and last too leave. Residents have already been asking what the next theme will be so that they can get outfits ready. Hi Helen, good idea. Thank you for sharing. For our table decorations I use small drink cups filled with plaster and inserted skewers. let set for about 10 minutes or so to make a hole in the plaster. remove skewer leave plaster to dry overnight. cups can be covered in cellophane or tissue paper and skewer and pictures changed for monthly theme events. I used tiny aussie flags for this month.